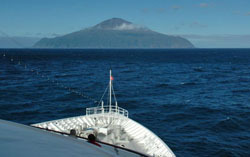 Reports of visits by cruise ships to Tristan da Cunha during the 2008/2009 season. 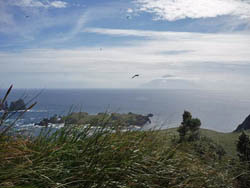 Professor Molchanov arrived at Tristan on the 5th April quite by surprise at 8.30am, the weather was sunny and the sea calm. We had had an email from her the previous evening and she wasn't due in until 11am. . Immigration boarded first and cleared the ship and passengers came ashore at about 9am. Disembarkation was pretty quick as they used 3 zodiacs. Passengers were met at the harbour by myself and some of these went immediately on a village tour with our tour guide Judy Green. A few others went with our Conservation Officer Brad, on a tour of the east fence trying to catch a glimpse of a cattle egret. The rest of the passengers wandered around the village and patches area at their leisure. 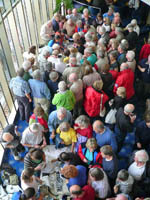 A few passengers were interested in golf and this was underway at 11.30am. Golf always seems to be popular as our course is so unique. The highlight of the day was a sighting of a Tristan Thrush (Starchie) at the Potato Patches, most of the passengers who heard the news rushed out to get a look. 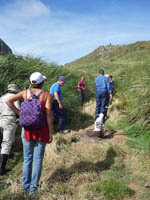 All activities ended with refreshments at the Pub and Cafe. Passengers boarded the ship at 5.30pm. On Monday 6th April guides were taken aboard the Molchanov early in the morning and they headed off to the outer islands. However, landing was not possible and so the ship returned to Tristan. 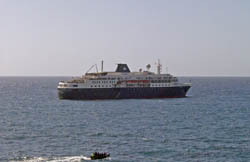 Guides stayed on overnight and in the early morning the ship departed a second time to Nightingale and Inaccessible. Again to no avail, the weather had by then deteriorated quite badly and when the ship arrived back at Tristan the guides had to be picked up by our Search and Rescue Rib. The Molchanov is now on her way to St Helena. Day 1 - Arrived on Sunday 29th March early morning. Weather was absolutely beautiful. 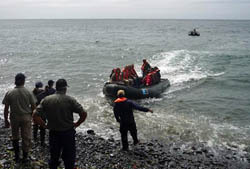 Passengers came ashore at about 9am. 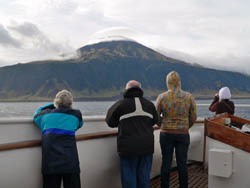 After landing, some passengers went on a cultural tour around the settlement, cultural tour to the 1961 volcano and we had a few passengers interested in a walk to the patches as well as a taxi tour to the patches, all with local guides. A few passengers were interested in golf and so had a go on our course. This went down a treat and they were impressed by the uniqueness of it, and enjoyed a new package which offered a golf tie, golf certificate, score card and a play on the course which is now included as a regular option for visitors. Day 2 - Another nice day but a bit cooler. 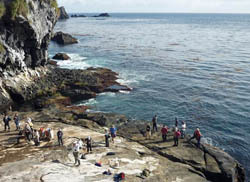 Eleven passengers went on a trip to the peak with two local guides. 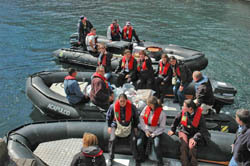 A fishing trip was organised by boat with two local fisherman and a few of the passengers went off on this excursion. The fishing trip was a success and they caught a lot of fish from Cape Mackerel to Steambras. A few more passengers wanted to play golf as the people previously had had such a great time. I took a few passengers on a tour to Peter Green's house the area of William Glass house, School and Factory. The rest of the passengers wondered around village and patches area enjoying the lovely sunshine. Day 3 - Europa left before daybreak and went of to Nightingale. She was followed by the Police Rib with local guides. Weather was calm their and passengers were able to land. After this event the barque Europa left for Cape Town on 31st March. This 350 passenger capacity ship was unable to land passengers as planned due to a lack of (their) time, and despite brilliant weather. So the visit was restricted to a team of Islanders going aboard to sell stamps and souvenirs. National Geographic Explorer fared well and saw the sunny side of Tristan. 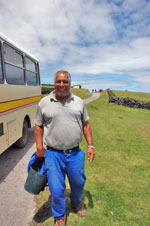 All 87 passengers landed safely and took part in the inaugural Tristan Cultural Tours which saw three groups head up the volcano while a larger fourth group were taken around the settlement - all privy to sides of the island only an islander can share. In the afternoon after crayfish sarnies and cool beers at the Hall 57 passengers stayed on the island for further exploring - some set off on foot in the general direction of The Patches while others opted for the new cultural bus tour to the patches with unique insights and snippets of the island's oral history... the best bits of course, scandal included. 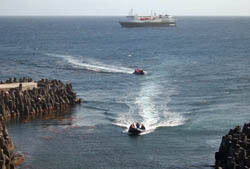 A few weary walkers hitched a lift back to the Hall in the police vehicle in order to make the boat in time and then they sailed off towards the horizon and, somewhat distant, Cape Town. All in all a great visit. Centre : Passengers on the 'road' to the Nightingale Ponds with Yellow-Nosed Albatross chick in nest conveniently in the middle of the 'road'! 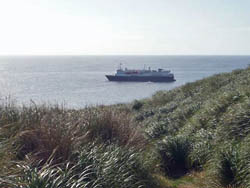 Right : MV Explorer from the 'road' showing the typical Spartina tussock grass which smothers most of Nightingale Island. Paths are always called 'roads' on Tristan and lakes 'ponds'! 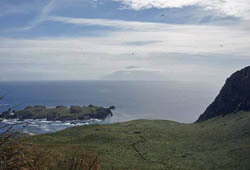 Photographs from David Morley (Taken by Jacki Morley) above show MV Discovery anchored off The Settlement, left, and departing, right, with a view over the island cemetery. MV Discovery arrived on 23 February as scheduled but, having been plagued by bad weather throughout her passage, her luck was no better on arrival at Tristan. After weeks of glorious summer here on the island, she arrived the morning after the night before... and the night before saw gales blowing through the flax. Despite brightening skies throughout the day the swell, a very sizeable one, persisted and prevented any passengers from disembarking. This was a great frustration to all on board, 375 of whom were British and felt an obvious connection to this remote territory. 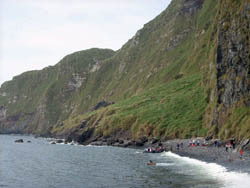 However, those hardy islanders who braved the waves to board the ship with handicrafts, souvenirs and postal services could testify to the wisdom of the Captain's difficult decision. 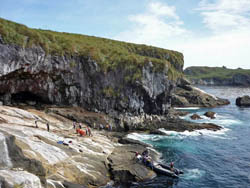 Despite years of rope ladder experience and agility, getting on and off the RIBs was very challenging and several islanders were to be found in quiet corners of the ship a little green around the gills. With a passenger list of over 500 it really wouldn't have been possible to disembark everyone via rope ladder on such a large swell. Still, a huge shame for islanders and passengers alike, especially since they had a similar experience at South Georgia. Nevertheless everyone made the best of the situation and souvenirs and postcards were very enthusiastically snapped up with stalls swamped for hours and Conrad shared his own unique island experience in a well-received presentation. 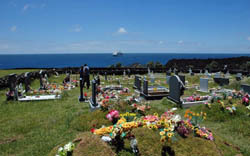 Above : Tristan's cemetery with MV Europa at anchor. 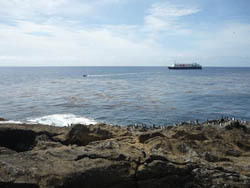 These pictures were kindly provided by german journalist Andreas Hilmer who was a passenger on MV Europa.